I don't normally do this, and by doing this I'm not inviting every artist I've blogged about to enlist me in helping to win an online contest, but I'm a big fan of Kevin Peroni a/k/a Wiretree's music, and I think it would be extremely cool to see him on Austin City Limits. So I'm asking my readers to vote for Wiretree in a contest that mp3.com is running to get an independent artist a spot in the 2007 Austin City Limits Music Festival lineup. Click the banner below if you so choose, and give Kevin a boost (he's made it to Round 3 but is 13th now and needs to make the top 5 to advance to the final round). His full-length debut Bouldin is #2 on my top 50 of 2007 in case you're still unfamiliar with him. 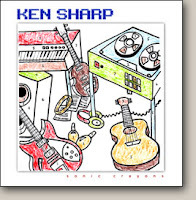 Ken Sharp has been something of a power pop renaissance man, having started out as a music writer (having authored or co-authored 10 books), and then actually releasing his own albums (1301 Highland Avenue and Happy Accidents) to great acclaim on Not Lame's label. It's been seven years since Happy Accidents, and now Ken is back with Sonic Crayons. The wait has been worth it, as he's given us a strong contender for Top 10 of 2007 honors. While his previous two discs were outstanding in a lighter, sugary manner, Sonic Crayons has a meatier, crunchier sound and features help from Enuff Z'Nuff's Chip Z’Nuff and Donnie Vie. On discs this good, it almost seems unfair to pick out individual songs lest others be slighted. Nevertheless, those more equal than others include "Better Every Day", "Melody Hill" (a contender for Top 20 tracks of 2007 honors), the rocking "New Attitude", the languid and Beatlesque "So Simple Radio", the catchy as-all-get-out "Get Yourself Together" and the beautiful ballad "Why Girls Cry". It's available through the usual suspects, but your best bet is ordering it directly from Ken at his myspace page where you can also listen to four of the tracks including three highlighted above. Joe Jackson might have admonished us once to "look sharp"; now I'm advising you to get Sharp. Those of you who saw David Bash's midyear top 25 last month may have noticed a band that hasn't been talked about a lot in the power pop coummunity listed at #8: The Orchid Highway. Well, I'm going to do my part to change that, as their self-titled full-length debut is worthy of the spot on David's list (and undoubtedly, one on mine at year's end). Some have called this Vancouver band Western Canada's answer to Halifax's Sloan, and while there may be something to that, they have a bit more of a singular sound. I've always thought that every great power pop album should have at least one undeniably "killer" track on it, and these guys come through in spades: "Sofa Surfer Girl" leads off the disc, and you might end up wanting to hear it two or three times before moving on to the next one. Opening with chords reminiscent of "Dig a Pony", it goes right in to a more traditional Beatlesque sound with one hook after another. If these guys had been around in the late 90s with this one, it very well could have found its way onto the radio along Ben Folds, Semisonic and Fastball. "Sofa Surfer Girl" is a tough act for the rest of the album to follow, but the Orchids are up to the task: "Medicine Tree" is a fast-paced pop/rocker that earns them the Sloan comparison; the largely acoustic and trippy "Let's Stay In Instead" has a winning melody; "Next World" has a Nugget-y, Rainbow Quartz-like sound to it that reminds me of another Canadian act, The Telephatic Butterflies; and "Pop Tart Girl" sounds just like you'd imagine. Also not to be overlooked are the McCartneyesque "Tea With Shandra", and the tres cool closer "Legion Hall", with a middle section that could have come straight from an old Del Shannon record. This disc hasn't found its way to the Kool Kats, Not Lames and CD Babies of the world, so you'll have to order it directly from the band at their MySpace or their official site. They've also recently played IPO Los Angeles and are set to perform at IPO Vancouver, so get out and see them if you're in that neck of the woods. Starter-Through The Morning Sky. This Madrid-based band came out of nowhere last year to place #65 on our top 100 of 2006, and now they're apparently getting US-based distribution. If this one is missing from your collection, remedy that oversight now. The Chevelles - several releases. Recently, eMu's added a number of Chevelles titles, including their best-of, Delerium, and the excellent Girl God. This is pure power pop with a capital "P", from Australia's answer to The Lolas (or perhaps that should be the other way around, since the Chevelles have been around longer). AM-Soul Variations. The latest from this poppy singer-songwriter, whose Troubled Times was a fine release and also available on eMusic. Comes with a special eMusic bonus track. Luke Temple-Snowbeast. I enjoyed his 2005 release Hold a Match For a Gasoline World, so be sure to at least sample the latest from this singer-songwriter with a keen pop sense. Milton & The Devil's Party-How Wicked We've Become. Intellectual power pop? The band is comprised of professors of literature at Widener University, and their somewhat esoteric lyrical moments are in service of great Figgs/Elvis Costello/Graham Parker-sounding pop/rock. Imperial Teen-The Hair the TV the Baby and the Band. If you could find "indie pop" in the dictionary, this band would be staring you right in the face. Here's their latest. Saturday Blurb-o-rama, Roundup, whatever you want to call it. Still making up for lost time here, so I figure I'll trot another batch of discs for your consideration. Every once in a while I feel compelled (usually as the result of random iPod play) to bring up a a two or three-year old release that seems to have been overlooked by the power pop community at large, and today's installment brings us Sydney's Sugarhit and their 2004 EP Takin' For a Ride. They're appropriately named, at least as to the "Sugar" part (had they debuted in the 70's, the "hit" part would likely be true as well), as you get sugary-sweet vocals and melodies over a solid rhythm section, yielding power pop bliss. "Brand New Baby" (not to be confused with the Semisonic semi-hit of the same name) sets the tone from the start with its catchy melody, and "We Go Round" follows with a sound that might best be described as "playful garage". This leads to the disc's best track, "Wherever We Want", whose chorus I defy you to get out of your head after hearing it. "Save My Love" is another delight, and was featured in a Not Lame Podcast. Like all of the best EPs, this is quality over quantity, so if you missed this one when it came out, don't overlook it again. Still getting my sea legs here, I plan on having another "blurb-o-rama" in the next day or two, and perhaps a CD of the Day or two. In the meantime, things remain pretty quiet on the power pop front at eMusic, but there are a few releases to note. The latest from Aussie powerpopper Danny McDonald, Summer City, has been added. Sez Bruce at Not Lame: "As with the best of Australian Power Pop, Fans of DM3 and The Chevelles will want to check out McDonald closely. For fans of shimmery guitar pop, hooks and ringing chords...they are all here. Add some surf, garage and earthy country yearnings in the fully framed picture of what Australia Pop is all about, you have Danny McDonald". Helpful reader Mike pointed out in comments to the last post that the John P. Strohm disc, Everyday Life, is on eMu as well, so in case you didn't see the comment, I figured I'd mention it in a post. I also neglected to mention that the new Josh Rouse disc, Country Mouse City House, is on there too. While nobody was a bigger fan of Rouse through his 2005 release Nashville than myself, I found last year's Subtitulo to be a disappointment, and while the new one is better, it doesn't quite measure up to his brilliant run of Under Cold Blue Stars/1972/Nashville. But you can judge for yourself. Finally, although he isn't power pop, I've always had a soft spot for Al Stewart, and his 2005 release A Beach Full of Shells is now on the site as well. Like new discs from many other artists who were big decades ago, it's a latter-day release that has its moments but doesn't rank with his best. Didn't plan on 2+ weeks of blogging inactivity, but things have been quite a bit chaotic for me recently, on many levels. Anyway, to play catch-up, I've going to mention a bunch of discs that caught my fancy in the meantime (or just before) in a "blurb-o-rama"-type fashion (apologies to the Power of Pop guys), along with some other tidbits. First of all, one reason I haven't at least had an eMusic "filler"-type post up in this period is that they really haven't added anything compelling from a power pop perspective lately, save for the new Crowded House disc, Time on Earth.